Hi Y’all!! 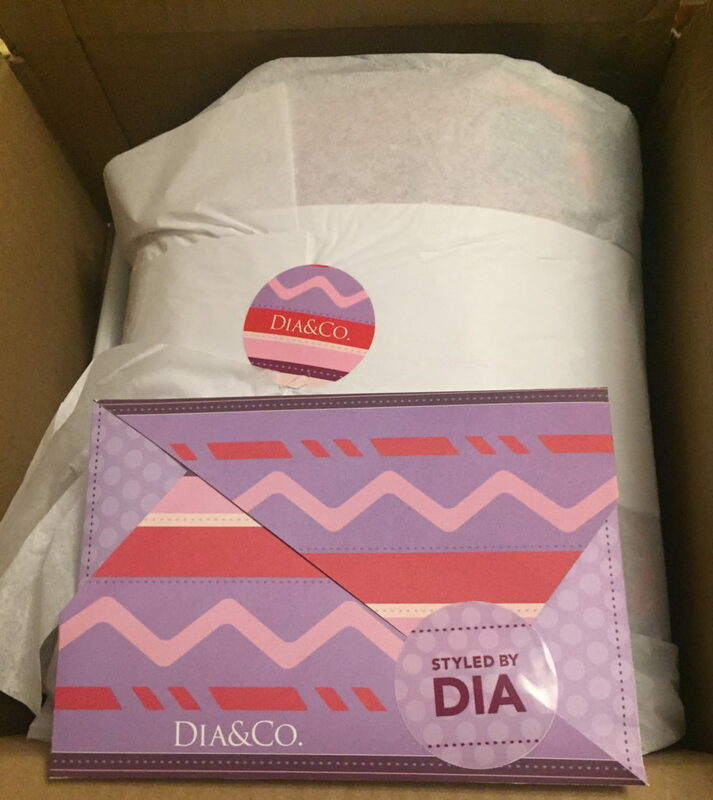 I received my third Dia & Co Box about 3 weeks ago, but with the holidays, travel, and a wee little bit of a dislocated finger I am just getting around to posting. 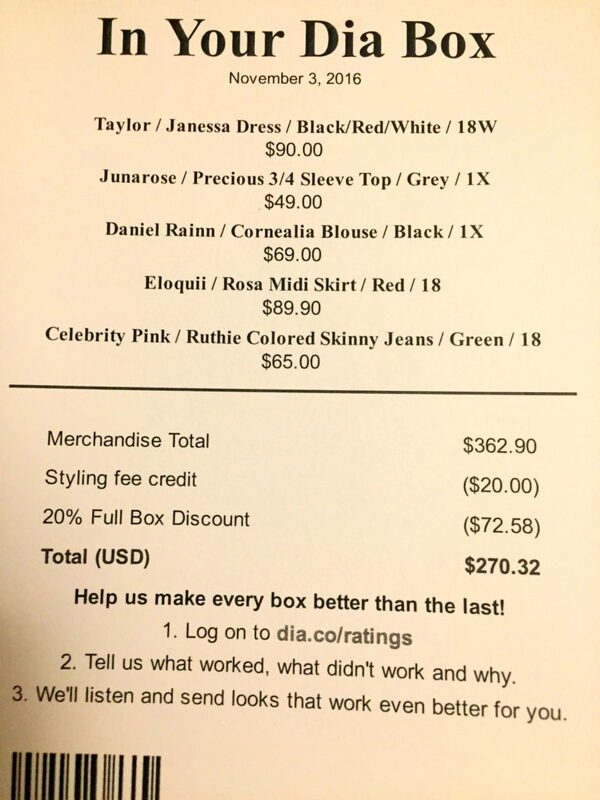 After the last box, I asked my stylist for some leggings and a warm, chunky sweater if possible (hence the sweater reference in her note). I do love that with Dia & Co I have worked with only one stylist, and that over time she will get to know my preferences. Pretty great. She did a really great job with this box, even though I did not keep everything. Also, sorry for the picture quality. Due to work travel I only had about a day to decide what I wanted to keep (you get 5 days but my box arrived when I was out of town so what I did not want had to go back ASAP). The price points in this box were pretty good for the most part. I will say that I would have to really love or really need an item (or both) to spend upwards of $100 for one piece…..
That said…I LOVED this dress. I am finding that I am more comfortable wearing prints and this dress was so much fun. Very Mad Men, right? I liked the cut of this dress a lot however the size was a little big so an exchange would be needed. Now, all that said….I decided not to keep it as I just did not see myself wearing it that often. I felt it was a bit too much for work, and though we do social things pretty often, they are usually pretty casual and dressy events are kind of few and far between. 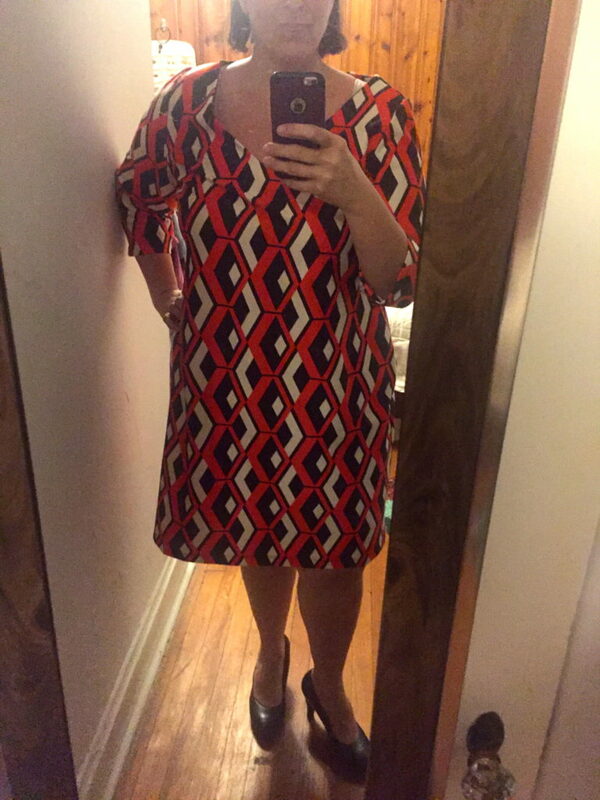 Believe me….I tried every mental tactic to try to justify this dress. I almost fell back on my “I LOVE this” rule, but ultimately (and with Christmas and lots of fun travel coming up) I sent it back. Bye bye my sweet, funky, fun friend. It was suggested by my stylist to try these two items together. 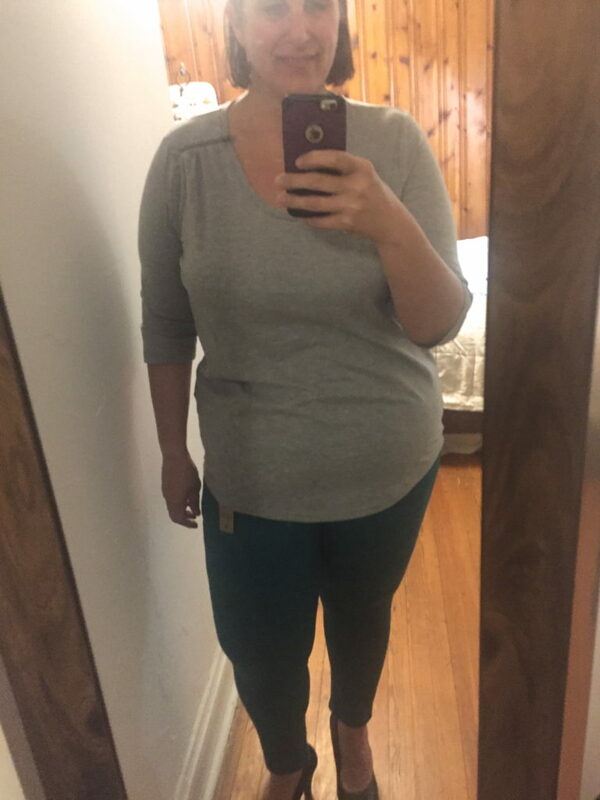 I did not like the style of the grey shirt on me, but I did really like the green skinny jeans. The color and tighter fit are both a little outside of my comfort zone. I went for it none the less and kept them. Pic is not the best but they are a bit of a yellowish green and pretty fabulous. 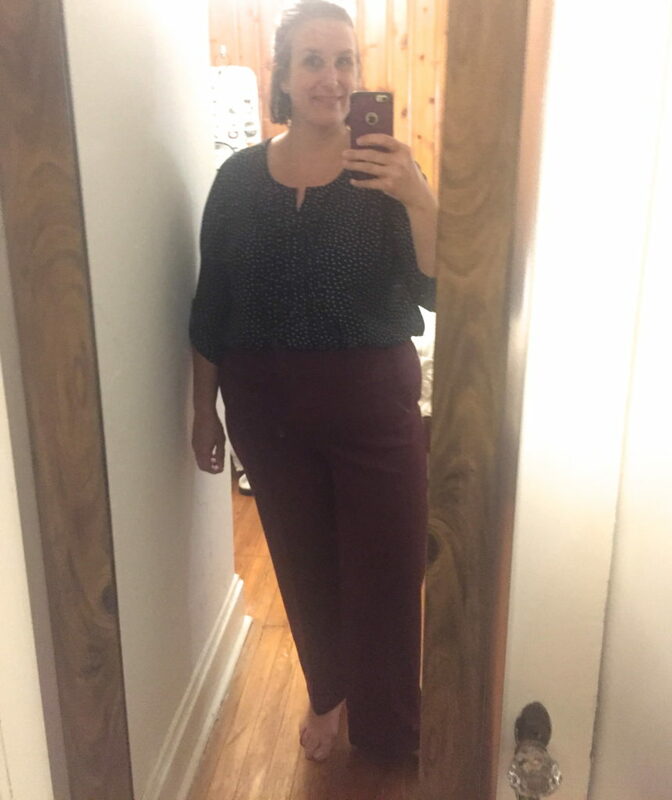 I really liked this Cornelia Blouse and paired it with my Pintuck Ponte Maroon pants from Cato to try it on. I loved it and this has been worn to work a few times already. This skirt! 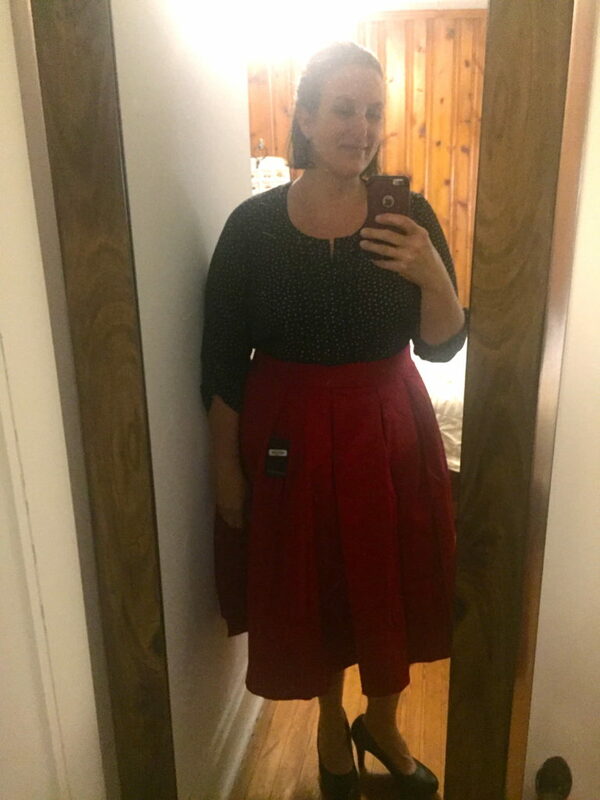 Oye…I went back and forth on this skirt. Pros- the color (beautiful red), I loved the fit at the waist, it was slimming (I think), and lots of great colors that it could be paired with. The cons- I did not like the length and would have had to get it hemmed a little (just my taste) and ultimately, it came back to the question of how often would I wear this. Work…maybe but still feels pretty dressy. Out…maybe but how often? So…it went back. There we are my friends. Hope you all had a wonderful Thanksgiving filled with love, family, warmth, laughter, and, of course delicious food!